Wasps have thousands of species with countless variations. They come in many different sizes, shapes and colors. The largest wasp can get up to 12.5 cm (5 inches) in length and the smallest wasp is less than .02 mm in length. Their colors can vary between green, yellow, blue, orange and black. Some wasps are matte and others have vibrant colors and shines. Wasps first appeared in the Jurassic period 140 million years ago and are still very prevalent today. Wasps can be found on every corner of the earth except the Arctic. Wasps are common to woodlands, orchards, meadows and urban areas. When introduced into residential settings, wasps thrive under dry areas such as roof eaves, gutters and window awnings. Most wasps eat a variety of caterpillars, spiders, bees, ants and other similar invertebrates. Some wasps also like to eat honeydew produced by scales. In some cases wasps can even prey on birds and other small vertebrates. Wasps are classified into two groups: social and solitary. Social wasps live in colonies with highly organized duties. The queen devotes her time laying eggs and paper-like nests are constructed for her eggs. These nests are constructed out of plant fibers, mud and wood pulp. Worker wasps tend to the nest and other responsibilities such as caring for young, hunting for food or defending the colony. The majority of wasp species are solitary, meaning they do not live in a social colony. Once the female mates, she forages on her own to build a nest for her young. Once the nest is constructed, the female wasp assumes all duties such as caring for young, hunting for food or defending the colony. Solitary wasp nests are more diverse than social wasp nests. Some nests are burrowed beneath the earth and others are constructed purely out of mud. Determine if you are allergic to wasps. A physician can determine if you will have a negative reaction to wasp stings by administering an allergy test. Identify which type of wasp species you are dealing with. 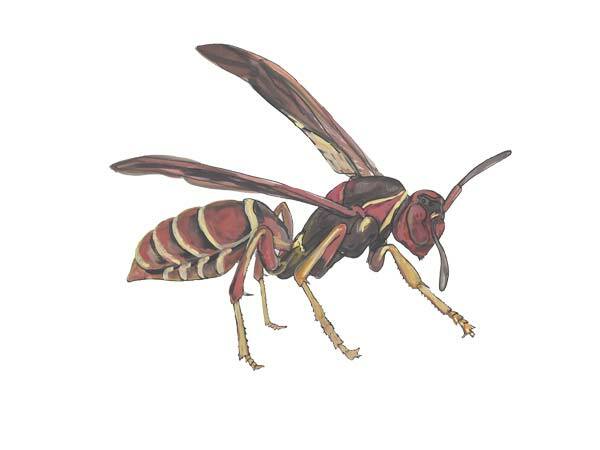 The three main wasp species are yellow jackets, paper wasps and mud daubers. Knowing about the specific wasp species can help with eradication procedures. Protect yourself with proper clothing. Even if you are not allergic, it is important to protect yourself with appropriate clothing to prevent painful stings. Wear long pants, thick socks, boots, long sleeve shirt, hat, goggles, scarf and gloves. Spray the nest with a long reaching aerosol or foam insecticide. Be aware of your surroundings. Do not stand on ladders or chairs to reach high places. Some people injure themselves badly by falling off ladders after treating wasp nests. Pesticides for wasp nests are extremely toxic, so make sure children or animals are not around during the application. After all wasps are eradicated, knock down the nest with either a hose or an extension brush. Properly dispose of the dead wasps and the nest when finished. Wasps contain a sharp venomous stinger located in the lower abdomen and is easily used for self-defense. Wasp stings are common in Florida during the summer months especially when nest populations are peaking. Unlike bees, wasps can sting multiple times without loosing their stinger. Initial reactions include: Acute pain, burning sensation, swelling, tenderness and itching. Red welts commonly form after the venom is injected into the skin and will likely recede within several hours. For some, wasp attacks can be life threatening. The most severe reaction to wasp stings is called anaphylaxis, a potentially fatal response when the immune system overeats to the wasp venom. We have been getting rid of wasps in home since 1934. We serve Bradenton wasp control, Sarasota wasp control and all surrounding areas. Call us today to solve your wasp problem.